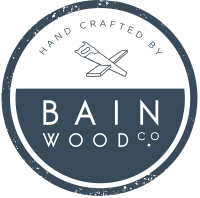 My name is jono and I am the creator of Bain Wood Company. Born and raised in Tomball, Texas, I graduated from University of Texas (hook 'em horns) with a degree in education. after almost 15 years of teaching I decided to follow my passion of woodworking full time. my wife, emma was born and raised in london, england. after ten years in the oilfield and three years of marriage, she's almost texan. when emma isn't working on our business, she works as an independent sales consultant. we have a passion for designing and creating items that are personal to the lives we live. Cutting boards, portraits, home decor, trophies and even the occasional rabbit hutch are in my repertiore of past projects! I love to make items for people who have a vision and entrust us to help them make that vision come to life! If you have a project or request, please do not hesitate to contact us. thank you so much for stopping by our page. we appreciate your interest in bain wood company and look forward to working with y'all soon!